We are currently looking to add an experienced tattoo artist to our Mansfield location. We are a custom tattoo and body piercing shop and are looking for an artist to fill a booth in our new studio (recently remodeled from floor to ceiling). Must be licensed in the state of Massachusetts, have a positive and fun attitude and have reliable transportation. Must have own tattoo equipment, have a current portfolio, be reliable, hard working and self motivated. Established clientele is a plus. Please call 774-719-2821 and ask for Aaron or Jaime or reply to this listing with your work history and cover letter. Please bring your portfolio and your credentials with you to apply in person. We are open from 12pm to 9pm Tuesday-Thursday and 12pm to 10pm Friday-Saturday. We are currently looking to add a TEAM member to our family here at Master’s Method Tattoo & Body Piercing located in Mansfield, MA. We are a custom tattoo shop and we are rapidly growing thanks to our wonderful and loyal clients. Here at Master’s Method we keep a fun atmosphere while staying professional and courteous. Must be licensed in the state of Massachusetts, have a positive and fun attitude and have reliable transportation. Must have own tattoo equipment, have a current portfolio, be reliable, hard working and self motivated. You should have a clean and well kempt appearance. We are NOT looking for counter help or apprentices at the moment. Please call 774-719-2821 and ask for Aaron or Jaime or reply to this listing with your work history and cover letter. Please bring your portfolio and your credentials with you to apply in person. This tattoo is a tough piece. 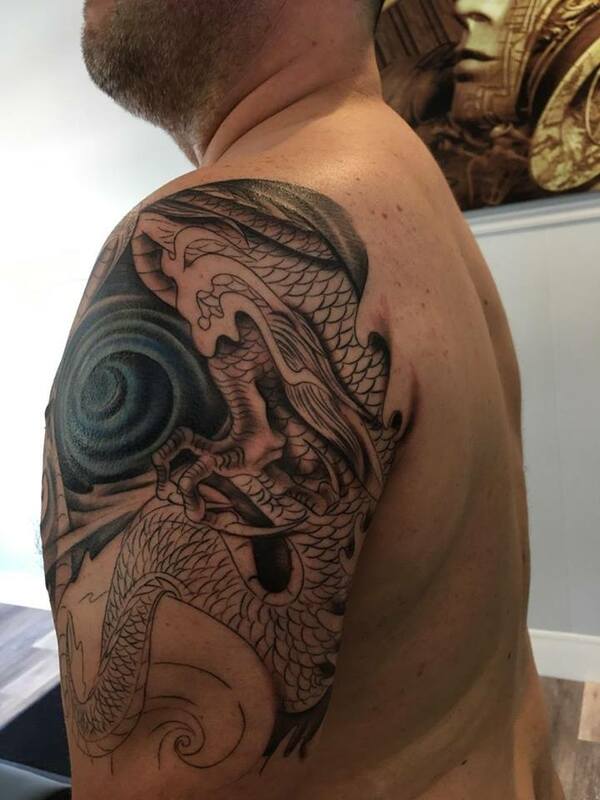 The client wanted to cover up an old tattoo with a Chinese fighting Dragon. 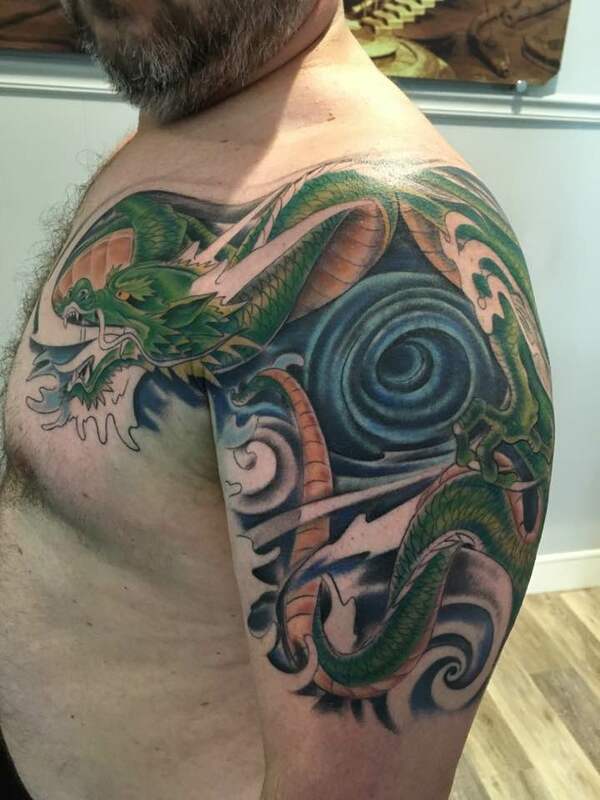 Dragon tattoos are one of the hardest to create on a person due to all the tiny details. This gentleman has a been a great client and I am happy to take on this challenge and make him not only a happy customer but a client for life. I look forward to the upcoming sessions to finish off this piece. Last night was great! Thank you to everybody that stopped by the shop and checked out our portfolios. We had a great time giving all the kids temporary tattoos! Master's Method Tattoo was born out of the need to innovate and practice the art of tattooing in a way that satisfies the need to create.We always strive to exceed the expectations of the client while breaking new ground artistically.Twenty years ago the industry had not seen the trained artist turned tattoo artist.Fast forward to today and we have many styles and equipment that allow us to make things possible that where not previously.The artists here are career tattoo artists that eat sleep and breathe the tattoo lifestyle.In addition the ever evolving world of tattooing can only be met with the drive and dedication of a serious individual who does not get intimidated or waver at the invitation of a challenge.Come see what we do best and be the judge our friendly and knowledgeable staff can lead you in the right direction and turn your dreams into reality.